Our 100% reclaimed lobster rope runners are one of a kind creations made in Maine. Dress up your kitchen and hallway or brighten your outdoor spaces while reducing marine waste. 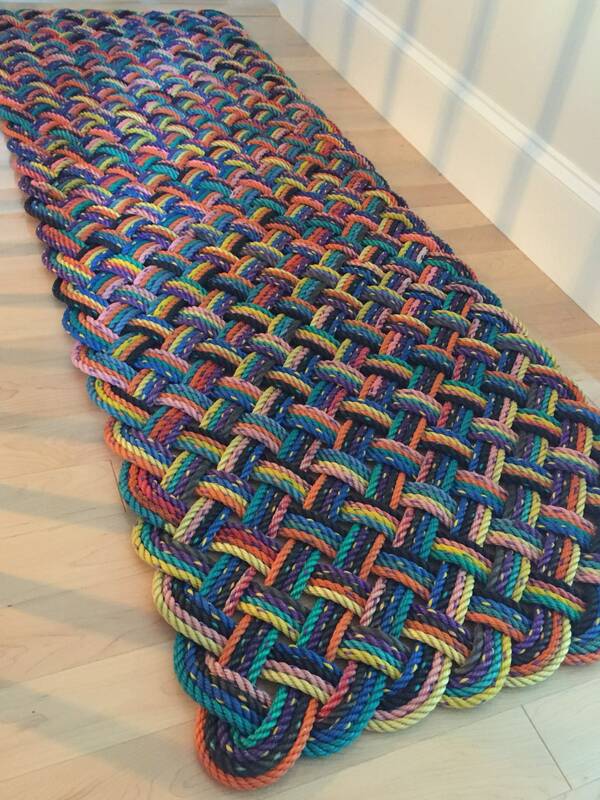 A handwoven nautical runner made from time-worn rope. Great for indoors or outdoors on patios, decks, gardens, walkways, etc. Easy to clean! We take varying lengths of 3/8" rope and bond them together into a single strand (reducing our scrap waste), then neatly weave them together to create a truly unique runner. Our runners are extremely durable and are well suitable for either indoor and outdoor use. They are easy to clean with a hose, power washer or dip in the ocean/lake. The runner measures approximately 6'-2" x 2'-2.5" x 1.25"
The pattern is woven with 4 passes of varying length and multi-colored lobster rope. The pictures shown are exactly, or very similar to, the runner you would be purchasing.